West Ham XI: Adrian, Tomkins, Collins, Ogbonna, Cresswell, Lanzini, Noble, Kouyate, Antonio, Valencia, Carroll. Liverpool XI: Mignolet, Clyne, Lovren, Sakho, Moreno, Can, Lucas, Ibe, Coutinho, Firmino, Benteke. Liverpool have lost three of their last four away games without scoring. Again, they had plenty of possession in this match but they're failing to create enough chances. West Ham were the strongest side and deserved the win. "A fantastic result for West Ham. West Ham's bad run was because of the injuries they had, and they did suffer. You look at Carroll and Payet and them being fit gives the club a big lift. "Fifth in the table is fantastic for West Ham." "The big lift for West Ham is having Andy Carroll and Dimitri Payet back fit. "They look like they have gone through a poor run, but now find themselves fifth in the league. They have every opportunity to break into one of those European places. "The talk last summer was 'make sure we stayed in the Premier League' but it won't be like that now." A fine start to 2016 for West Ham who earn a deserved win to move fifth in the league, while Liverpool drop to eighth. We're into the final minute and West Ham are about to extend their unbeaten run to seven matches. "Christian Benteke is getting a lot of criticism, but I don’t think people realise how difficult it is to play up front on your own. If you’re playing up front, you expect the team to create chances for the strikers." There'll be three minutes of added time in this match. On this display, Liverpool wouldn't score even if they had 33 additional days to play this game. At the other end of the pitch, Joe Allen goes close with a header from close range and the Welshman should have at least hit the target. West Ham on the counter-attack... it's three against two... Dimitri Payet releases Cheikhou Kouyate but his shot is saved by Simon Mignolet. For all their possession, there's been little evidence from Liverpool that they possess the guile and creativity to score two goals in this match. West Ham defending deeply, comfortably seeing off the visitors. "Michail Antonio has been the outstanding player on the pitch. A man of the match performance. His goal was outstanding, but he has put in a really good shift for his team today. He is an easy player to fall in love with." Five minutes remaining and West Ham are on course to achieve a first double over Liverpool since the 1963-64 season. Liverpool have been below their best today, while West Ham will earn a deserved victory. James Collins bullying Christian Benteke, sniffing out any pass or cross which comes the striker's way. The Welshman has been solid in defence for the Hammers today. We're into the final 10 minutes and Liverpool are keeping hold of the ball as they search for that goal which could spark a comeback. But Klopp's men lack bite, perhaps they lack belief too. Christian Benteke demands a penalty after his header makes contact with Angelo Ogbonna, but the referee rightly ignores the striker's plea. Philippe Coutinhho with a low, driving daisy-cutter which causes all sorts of chaos for the West Ham defenders in the box, but the ball is blocked by Andy Carroll. There's a slight melee... words exchanged between Emre Can and Cheikhou Kouyate... but the referee deems a talking to is enough of a punishment. A dangerous-looking free-kick from Adam Lallana out on the left which is put out for a corner by James Tomkins. Corner Liverpool... Lucas with the header which is cleared off the line by Mark Noble. Now or never for Liverpool. Philippe Coutinho weaves through a couple of challenges, he's through on goal but the ball overruns and Adrian clears with his feet. Liverpool, again, the dominant team in terms of possession, but that matters little when you're 2-0 down. "Looking at West Ham with Dimitri Payet back, Andy Carroll fit and Michail Antonio getting regular football, it's quite a formidable front three for them for the rest of the season. "Slaven Bilic will be happy with the way the game is going, but will just want to make sure his side does not make any silly mistakes. You can't see Liverpool getting a foothold into this game though." Liverpool being patient as they wait for an opening. Adam Lallana and Philippe Coutinho creating pretty patterns, the Brazilian spots Nathaniel Clyne making a late run on the right... danger for West Ham... but the defender's low cross is cleared before it can find Christian Benteke. Liverpool have Simon Mignolet to thank that the score remains 2-0 with the Belgian brilliantly stopping Andy Carroll's header from six yards. Philippe Coutinho chases Christan Benteke's header, but James Tomkins toe-pokes the ball away from the Brazilian playmaker. Liverpool have yet to hint at any comeback. Just the one shot of their 17 attempts on goal have been on target. A rousing reception from the West Ham fans as Enner Valencia leaves the field for Dimitri Payet. Hammers fans are glad to see the Frenchman who has been absent for a few months because of injury. A wasteful ball from Lucas, straight at Enner Valencia. A scrappy couple of minutes in this match with much of the play happening in the middle of the park. A double substitution for Liverpool. Firmino is the man sacrificed for Adam Lallana, while the young Brad Smith is coming on for Alberto Moreno. Alberto Moreno with an outswinger towards Christan Benteke, but again West Ham deal with those crosses comfortably. There needs to be a change of plan if Liverpool are to get back into this. Liverpool have created little in this match which suggests they're going to be unable to score the three goals they'll at least need for the three points. There's little for Jurgen Klopp to chose on the bench, either, with Adam Lallana the only attacking option. "Noble's weight of cross was perfect, he just feathered the ball into the box and told Carroll to get his head on to the ball. "It was an incredibly powerful header and that is what Carroll can do. Liverpool are out of this game." Trademark. Andy Carroll with a bullet header from six yards for his third goal of the season. A brilliant cross from Mark Noble on the right and Nathaniel Clyne again beaten in the air. "Moreno could hold the key for Liverpool unlocking West Ham's defence. He has to keep running forward and get past James Tomkins when he can." Liverpool dominating possession, but yet to work their way into the final third... Eventually they do, Alberto Moreno with a pull back for Christian Benteke and the Belgian side foots it well wide. It wouldn't have hit the target even if there were two goals to aim at. The Liverpool striker is having one of those days, it seems. A good, driving run from Jordan Ibe. The forward holds off Cheikhou Kouyate and finds Philippe Coutinho, but the Brazilian is high and wide with his effort. "I am sure Jurgen Klopp was disappointed with the first 45 minutes from his team. They don't look like Liverpool and where they are expected to be heading." Here we go. The second half is up and running. Are West Ham on course for a first double over Liverpool since the 1963-64 season? Liverpool's team are on the pitch, waiting for the Hammers to reappear from the dressing room. The visitors will nee to improve after the break if they are to get anything from this game. Here is where both teams have played in the final third. West Ham (left graphic) have looked to attack Liverpool's right-hand side. Liverpool have enjoyed over 60% of the possession, but have created very little. "The game has got very scruffy with some poor passing. If we are looking at Liverpool and wondering if they are anywhere near a title challenge then on this evidence the answer is definitely a 'no'. "The Can shot that hit the crossbar was the first time we saw any cutting edge from Liverpool. "They have not threatened West Ham's goal much. If West Ham score the next goal that will be enough. Jurgen Klopp has to go into his dressing room and rattle some of the Liverpool players." And that is that. Liverpool out of sorts, while West Ham have looked the more dangerous. Liverpool camped in the West Ham half, pressurising the hosts in these final minutes. Can the Hammers hold on? And that's the closest the visitors have come to scoring. Good work by Firmino on the right, the Brazilian finds Jordan Ibe and runs into the box to collect his team-mate's low cute cross... the Brazilian then lays off to Emre Can who rattles the crossbar from 20 yards or so. Lucas swings at fresh air as he attempts a volley outside the box and his comical attempt sparks ironic jeers from the home fans. Liverpool running out of ideas, and time, in this half. Talking of time, there'll be five additional minutes to this first half. Once again Liverpool's defence fail to deal with a ball inside the box. It's a throw in this time which is allowed to bounce at the far post and Aaron Cresswell's shot is deflected by Nathaniel Clyne and requires a low diving save from Simon Mignolet to stop it from creeping in. Liverpool have had plenty of possession, but have yet to create a truly memorable chance. "At this moment, it looks flat from Liverpool and if they keep meandering as they are then they will not come away from Upton Park with a win. There is a game to be won for both sides here." A standing ovation for Manuel Lanzini as he hobbles off. Pedro Obiang is the man who replaces the injured Argentine. Adrian needs some cotton wool up a nostril after Firmino's boot accidentally makes contact with the Hammers goalkeeper's hooter. There's another stop in play as Manuel Lanzini is on the turf. It looks as if the Argentine's day is done. Liverpool, more in hope than belief, ask for a penalty after James Collins clears a Philippe Coutinho shot with the side of his body. But the Welshman did his dirty work outside the box anyway. The visitors enjoying their brightest spell, monopolising possession and doing so in West Ham's half. "When Liverpool have got the ball wide, Jordon Ibe can be a handful. But he is up against Aaron Cresswell, the better of West Ham's two full-backs, so they may have more joy if they swapped him to go against James Tomkins at right-back. "Even though Liverpool have had the ball in the final third as much as West Ham, they look to have more of a cutting edge with Andy Carroll and Michail Antonio. "I think there will be more goals in this game." Listen to Stuart Pearce on BBC Radio 5 live by clicking the 'live coverage' tab at the top of this page. Andy Carroll is a little late on Nathaniel Clyne. An animated Jurgen Klopp demands a foul, rubbing his eyes as he looks towards the fourth official. Nothing is given, though. Liverpool jittery in defence and, once again, a failure to clear the ball around the box gives West Ham another chance... Enner Valencia, though, slices wide and the visitors are off the hook. Liverpool have yet to click. Jordan Ibe receives the ball inside the box, targets Aaron Cresswell but runs out of turf and the ball dribbles out of play from a promising position. Christian Benteke with a sniff after being put through by Firmino, but a heavy second touch allows James Collins to clear. The striker should have done better and his movement so far in this half will not please boss Jurgen Klopp. "We are right behind that Lanzini shot and I have sympathy for the Liverpool goalkeeper. As Lanzini has come inside the ball has moved a lot and hit the post. "I'm watching Lanzini, but seeing Joe Cole in the way he moves the ball. West Ham know exactly when to slow the play down and were unlucky not to make it 2-0." Jurgen Klopp, arms crossed, is shaking his head on the sidelines after a meaty Mark Noble challenge on Firmino which referee Bobby Madley says is a foul. A number of tasty challenges in the last minute. Lucas late on the Hammers captain and the Brazilian is shown a yellow. Liverpool with a corner, but there's no-one on Philippe Coutinho's wavelength. The Brazilian's low corner is easily dealt with by the Hammers who break away at lighting speed. Alberto Moreno, though, sweeps away the dangers, blocking Enner Valencia's effort. West Ham by far the more dangerous-looking team in the final third. Whoosh! Simon Mignloet is made to look as if he has treacle on his studs. Manuel Lanzini lets rip from the edge of the box. It gets the better of the Belgian but, luckily for the Liverpool goalkeeper, the post does his job for him. Manuel Lanzini is sloppy in possession, which gives Liverpool an opportunity to break. Firmino darts forward, finds Philippe Coutinho but the Brazilian's low cross into the box is harmless. The visitors trying to fight their way back into this one. "Mark Noble is a bit of an unsung hero for West Ham as he not played international football. But West Ham fans know his importance to the club." West Ham buoyed by their opener. Aaron Cresswell with a cross from the left, but Andy Carroll heads straight at Simon Mignolet. "That is what Antonio can do. One minute he is two yards away from his full-back making a slide tackle but a few seconds later he is getting in the opponents' box and scoring a header. "That is what a modern day wide player has to do." Poor defending by Liverpool. The unmarked Enner Valencia aims a looping cross towards the back post and Michail Antonio gets the better of Nathaniel Clyne to head home for his sixth goal of the season. A first sight of Manuel Lanzini waltzing through the middle of the park. Lucas brings him down, but does so legally according to the referee despite the home fans' protestations. Neither side truly dominating yet. "It is exciting times for West Ham, but also good times for Liverpool on the horizon as they think they have a manager that will be there for the long run. "West Ham have gone 4-4-2 with Valencia up alongside Carroll. "It will be interesting to see the work-rate of Liverpool's Christian Benteke. He looks the sort of player who needs pace around him. He is a good targetman but needs runners off of him." You can listen to Stuart Pearce on BBC Radio 5 live by clicking 'live coverage' at the top of this page. Jordan Ibe has made a bright start. He combines with Firmino on the right this time and whips in a cross which West Ham comfortably deal with. Much of the play has been in the Hammers half in these last few minutes. A first chance for Liverpool's players to string a few passes together. Jordan Ibe and Philippe Coutinho work an opening on the edge of the box, with the Englishman going a faction wide with a low driver toward the bottom left corner. A promising start. Grey skies in east London, but they're not leaking which is good news. Enner Valencia goes sprinting down the right, but the ball bobbles out of play. The forward, though, is stretching his hamstring, which is a worrying sign for the Hammers. Toot! That's the sound of Robert (Bobby to his friends) Madley's whistle. The referee gets play under way. We're off! 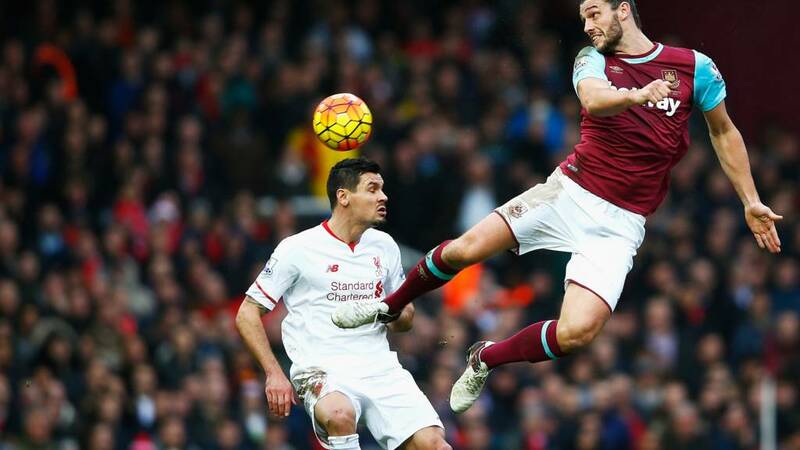 "Andy Carroll's ability as a target man would cause problems in any league in the world. But what he doesn't have is the ability to get a run of games. I hope he can overcome his injury problems, if not for West Ham's sake, then for England's." The players are on the pitch, the fans are singing about forever blowing bubbles. A minute or so until we kick-off. "Liverpool are contenders to win the league, like the other teams above them. If they have a good run, of course they can win it. "Klopp has been a boost for the Premier League. All the big clubs wanted to take him. He is good for the league. Expectations are high." "It’s intensive, we cannot ignore this. It’s the most intensive time in the year after an intensive time, so we are not on holiday for sure. "But it’s the same situation for nearly all the teams - we have two [cup] games more but that’s how it is. We wanted to go to the semi-final of the Capital One Cup and now we are in it, now we want to go to the final of course, and that’s what we have to deal with. "It’s a situation and we have to be prepared for all these games, that’s our job. It’s not that you can just say, ‘come on, boys!’ - that’s what we say and that’s what we expect but it’s really intensive." "Liverpool look more of a threat away from home at the moment. They are creating so many chances on the road but Christian Benteke - who has scored the matchwinner in their last two games - is a dilemma for Jurgen Klopp. The Belgian is scoring goals, but I think Klopp would prefer someone more mobile for his system. While he is their main striker and putting the chances away though, what do you do?" "Slaven Bilic had a great record against Liverpool under Brendan Rodgers. "In August he guided West Ham to a first win at Anfield since 1963, whilst his Besiktas side knocked Liverpool out of the Europa League last season. "Under Jurgen Klopp, Liverpool have put in some stunning displays (Manchester City and Southampton), but also some desperately poor ones (Newcastle and Watford): consistency is an issue. "Another issue is Liverpool's defending of set-pieces, a fault Andy Carroll will hope to exploit. "Still Liverpool's record signing, Carroll has two goals this season - both scored as a substitute, both in the 79th minute and both in 2-1 home wins. Liverpool's German manager may not know the expression that trouble comes in threes…"
Jurgen Klopp has shuffled his line-up for the trip to West Ham with Jordan Ibe and Lucas starting instead of Jordan Henderson and Adam Lallana. Captain Henderson has suffered a setback in his return from injury, while Lallana is on the substitutes' bench. I'm pleased to tell you there is team news to bring you. Andy Carroll starts for West Ham against his former club after coming off the bench to score the winner against Southampton on 28 December. The striker is one of three changes to the Hammers’ starting line-up, with Aaron Cresswell and Manuel Lanzini being the other fresh faces. West Ham beat Liverpool the last time these two sides met, winning at Anfield in the league for the first time since.1963. But can the Hammers do the double over the Merseysiders? They last did so in the, well, 1963-64 season. Welcome to our live page for West Ham United v Liverpool. We’ll have Radio 5 live and text commentary here from 12:30 GMT. You can keep up to date with all the build-up to today’s games here.